In 2016 Taupo Cycle Club will once again be running a Junior Development program, aimed at riders in the U13-U19 age groups. This years program requires a commitment to attend a set of North Island tours and WBOP championships throughout 2016 and heading into the 2017 season. There will be open age group events and assistance can be given towards these events. Taupo Cycle Club objectives are to help our youth riders to better themselves both as race cyclists and athletes, helping them to work towards and achieving their personal goals. This years program will be set on a multi. tier system depending on your age and experience and goals. Our approach towards the development program in the first half of the season is a racing to learn environment backed up with a camp to start, then a mid. year camp focusing on skills and preparation. And a pre. 2017 camp. For newcomers the first few races can be a steep learning curve that as a club see as a vital step for riders and parents to learn the finer points of cycle racing. The club will provide assistance with this learning. -Riders must conduct themselves in a professional manner on and off the bike, before, during and after an event. Bad sportsmanship, behavior or language will not be tolerated. - Parents will be expected to attend races as often as possible. -Current 2016 Club membership with a 2016 cycle NZ license. 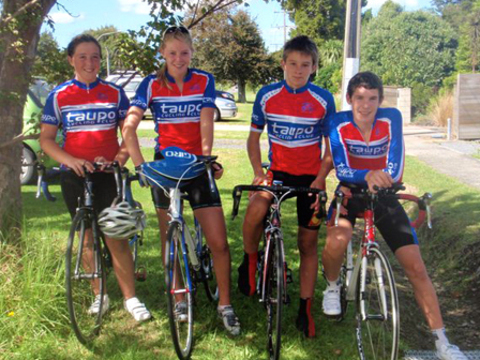 Previous Taupo Cycle Club development programs have been very successful with a number of riders achieving at National and International level. To apply for a place on the development program follow this link and fill in the information and we will get back to you with further details. Final date to apply will be 29th February. 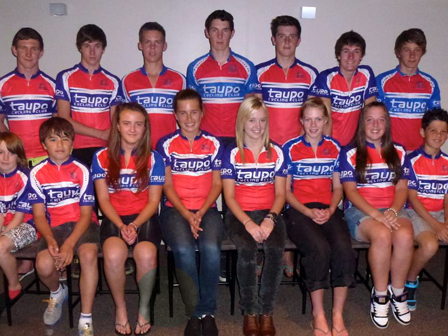 In 2013 the Taupo Cycling Club will once again be running a Junior Development Program aimed at riders in the U15 - U19 age group. This year’s Program requires a commitment to attend a set number North Island Junior Tours, WBOP Championships, Open Age Group Events and assistance towards the Age Group Road Nationals. Taupo Cycling Club's objective is to help our kids better themselves as both racing cyclist and athletes, helping them work towards achieving their own personal goals. Our approach towards development in the first half of the season is a racing to learn environment back up with a mid-year camp before moving towards the second half of the season, for newcomers the first few races can be a tough steep learning curve that as a club we see as vital for riders and parents to learn the finer points of racing. 2013 Season Structure Feb - May: Tours and Road Races Jun - Aug: Camp and Skills Sep - Dec: Tours and Road Race . This year’s program will be set up on a 2 tier system depending on your age, experience and goals. Individual training programs, advice and mentoring. Camp focusing on all areas of cycling, both on and off the bike. Paid entry Fees to races on the Development Program calendar. Junior gears must be used at all times. Riders are expected to finish all races within reason, i.e. expect for crashes or illness. Riders will conduct themselves in a professional manner on and off the bike, before during and after events; bad sportsmanship, language or behaviour will not be tolerated. Parents will be expected to attend races as often as possible. We have a total of 15 juniors that have been selected for the Junior Program – up from 4 last year. U19 - Frank Sutton, Nicole Scott, Corby Price. U17 - Jaymie King, Brendan Hawkins, Aidan Hawkins, Sam Dobbs, Lewis Eccles, Kyle Smith, Isla Sando. U15 - Claire Hume, Matilda Fulljames. U13 - Finn Giddy, Kiann Watts, Flynn Fierro. Last year’s inaugural Junior programme was very successful with our juniors achieving 4 NZ titles, numerous Tour age grade championship titles and a selection in the NZ development squad. Our juniors quickly gained experience and became better, faster & safer riders. Brad Setters is heading up the program, aided by Jarrod Alty and Cam Durno. The inaugural Junior programme was very successful with our juniors achieving 4 NZ titles, numerous Tour age grade championship titles and a selection in the NZ development squad.